Around here, the pants with the drop crotch go by the name of Hammer pants, y'know, after the one and only M.C. If you're looking for comfortable loungewear that also looks good walking down the sidewalk, these are the ticket. This project tutorial is for those with beginner to intermediate sewing skills. If you like to make things, or you're motivated by comfort, you can do this! 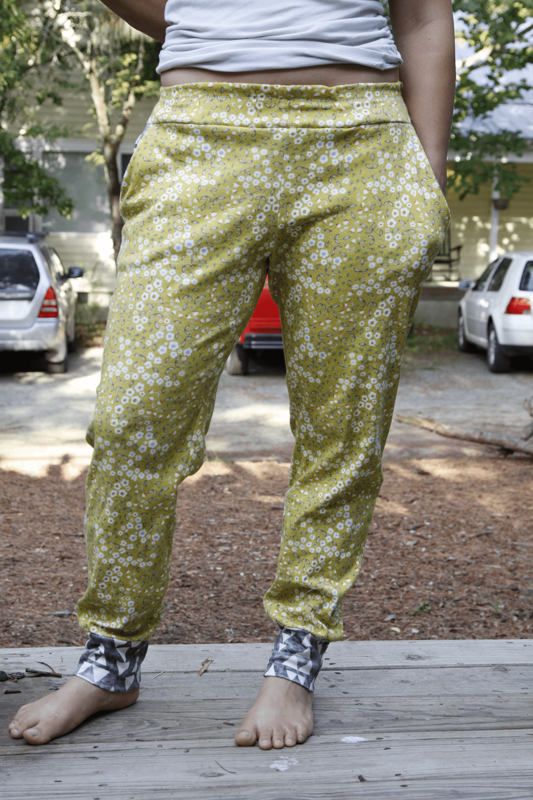 I used the Hudson Pant pattern from True Bias because it's comfy and relaxed but has a slight drop crotch style to it. I chose two designs on Spoonflower's Marketplace in organic cotton knit to make these, the loungewear of my dreams: "stacked" by Holli Zollinger and "ditsy mustard" by Patty Sloniger. I'm really into mustard and grey color combinations this spring, and what better to go along with it than a floral ditzy print?